Combat Optics Reviews was created to bring together the most rugged and fast shooting sighting systems on the market. Whether your use is combat, law enforcement or hunting, at least one of the sights depicted on the following posts should meet your needs. Magnifying reflex sights. These are typified by the Canadian ELCAN, British SUSAT and US Trijicon ACOG. All are immensely rugged magnifying optics. The advantage of magnifying optics is the ability to identify and engage targets at range. The disadvantage, epecially in higher magnificaitons, is narrow field of view, poor situational awareness and slow engagement, particularly of fleeting or moving targets. Some magnifying sights overcame this by having open or aperture and post sights or small 1x optical sights mounted on top. This results in a very versatile package covering the spectrum of engagements and has recently been adopted, in the form of an ACOG scope with top mounted ACOG reflex sight, by the British Army on its new L129A1 sniper rifle. ACOGs do not require batteries using a fiber optic light gatherer supplemented by tritium illumination for night use. Trijicon offer an immense range of ACOGs in a wide variety of magnifications and objective lens sizes with reticles varying with the intended application. They have been widely adopted by the US, British and Israeli armed forces and are routinely found on weapons up to 0.50″ in caliber. The US Marine Corps recently moved from open sights as standard to two ACOGs optimised for the ballistics of the M4 and M16A4 respectively (see below). Currently in service as the Rifle Combat Optic (RCO) of the United States Marine Corps, the TA31RCO is ballistically matched the 14.5" barreled M4 carbine. Tube reflex sights, typified by the Swedish Aimpoints are extremely popular for close quarter battle applications and the COMP M2 and COMP M4 have been adopted as standard by the United States armed forces as the M68 and are widely used by militaries across continental Europe. Tube sights offer a relatively narrow field of view with in-line night vision, their chief disadvantage. 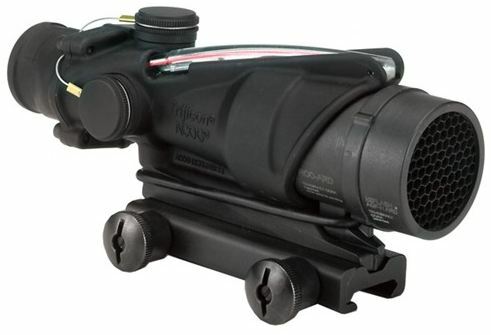 However, the Aimpoint is regarded as immensely strong and Aimpoint military models have great depth ratings. Aimpoints offer dot reticles as they are intended for relatively close ranges. 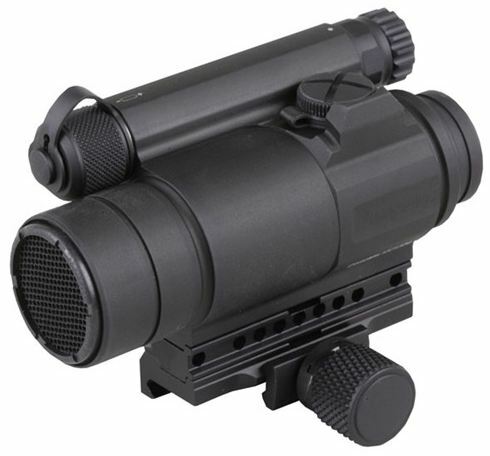 The range potential can be increased by adding a flip to side and/or quick detachable magnifier which can in turn be quickly substitued for night vision. Although they employ batteries, the latest Aimpoints boast immense battery lives at lower illumination intensities, in some cases measured in years. Holographic sights for small arms applications arrived in the early 1990s from Eotech, still the market leader in holographic weapon sights. They offer the great advantage that the reticle image can appear anywhere in the rear window so that partial obscuration of the window, or even its shattering will not affect the firer’s ability to aim. The main disadvantage is their use of a laser which drains the battery far faster than an LED. For this reason these sights feature auto shut-offs, set to eight hours but user configurable to four hours. Argument rage about the comparative ruggedness of the Eotech holographic weapon sights vs the Aimpoint tube sights, but they have been extensively emplyed by the US Army in front line infantry formations for some years. One Eotech model has been adopted by SOCOM and is rated to 66ft of sea water. The UK MoD employs an Eotech for defensive Dillon miniguns mounted on Royal Navy Warships and replenishment vessels of the Royal Fleet Auxiliary. Again, flip to side and/or quick detachable magnifiers and night vision are readily employed with the Eotech. Both tube and holographic sights are ultimately electronic and dependent on batteries. For this reason, recent emphasis has been on ‘co-witnessing’ back-up iron sights or BUIS, usually in the lower 1:3 of the sight picture. This gives an instant back-up should the battery or electronics fail. An alternative is to have another sight offset at 45 degrees to be employed in an emergency by canting the weapon. In due course we will return to each type of sight to examine their operation, features, benefits and relative merits in more detail. In the meantime, please explore the increasing number of models of sight detailed as posts on this blog. Should you make a purchase from our sponsor, I will make a small affiliate commission which will help support this site.